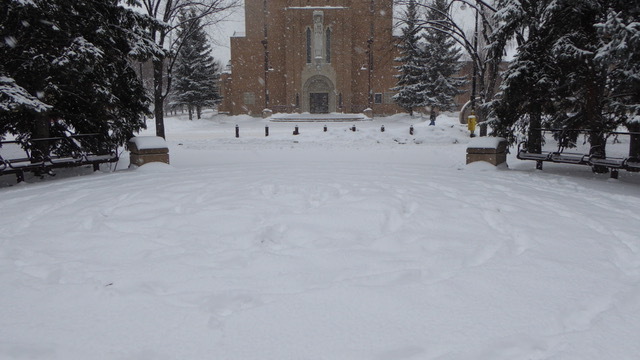 I had planned to go to the Elbow River to make and walk a snow labyrinth but found myself instead at St. Mary's Cathedral, a few blocks from my studio. To walk the spiral labyrinth with the Lady of course! The church grounds include a nunnery, schools and social service buildings. 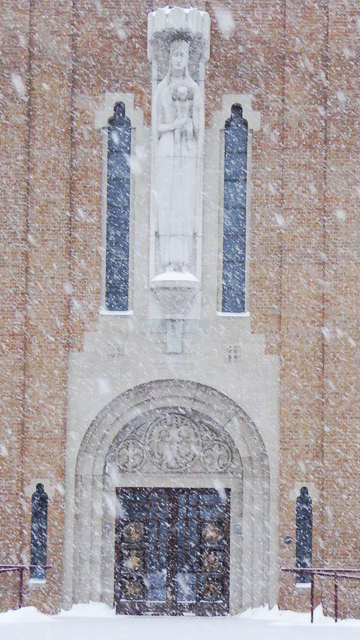 It was snowing, squeaky cold, and beautiful outside. The city rendered new-snow-quiet for a brief time. I was witnessed by a magpie who I visited at the end of the walk in the nearby tree. I love the end-of-day walkers who unknowingly joined; including children at the end of the walk. Nané's 50th Birthday Wombwalk from Medwyn McConachy on Vimeo. Entering the labyrinth room I feel that I need "radical nurturing." This morning I dropped into my tiredness and symptoms, remembering and feeling that its okay to accept and love myself with all this. I have been irritated and looking for distractions from what my body is feeling, and how off balance I am with my symptoms. Now I get the sense to HOLD and LOVE my body/self in my struggles, there is no where else to go but here. I comfort myself with this reminder after a busy few weeks post xmas and illness - I can drop into and care for myself, pay attention, move slowly. I feel so much gratitude for this labyrinth space and its SILENCE in the company of others. No one talks or has to talk. We walk alone yet together. As I arrive, there is a man sitting cross-legged in deep mediation at the centre of the labyrinth, his eyes are closed and he is unmoving, serene. Before I walk, I sit to the side of the labyrinth in my new favourite spot on the floor with a large cushion. This spot feels close to the earth and protected, like a small cave to hold myself within. I sit and close my eyes. I feel excited energy, as if green shoots are coming up through the core of my being, like I have a plant growing inside me. I feel my new snake-like skin growing on the outside after shedding old layers of skin. I feel how I still have LOTS to do in this life and I want to do. The recent full moon blessing was very snake-like for me. I felt undulating fluid movements throughout my being. As I begin to walk the labyrinth, my pending question about deciding to undertake travel to the US for a conference is answered with the message: Your hands are full. My hands are full - with all that is going on, now is NOT the time to add another trip or focus in my coming weeks. Its okay for me to let go of this trip, even through I'd like to connect with the women at the Matriarchal studies day, some very powerful and nurturing women. But now I feel more settled about not going to the US in March, its okay to let go of this - its too much with all else going on - my hands are full. After sitting at the centre, resting and releasing with breathing and gentle stretches, I am able to get to a place of rest and emptying. I walk out of the labyrinth, moving very slowly so that I loose track of time, step by step. I no longer feel irritation or the need for distraction from my body and my-self. I then feel one clear moment - I am walking into my grandmother's house. Walking into her home I get that feeling I always had from my grandma of being fully loved and accepted, a joy of reunion with the beloved. I am going through the door of the house of full love and acceptance.